A waterproof tent can be achieved in a number of ways. Many good tent brands factory seal their tents and do most of the waterproofing at their factory. Other tents need some work to waterproof them. 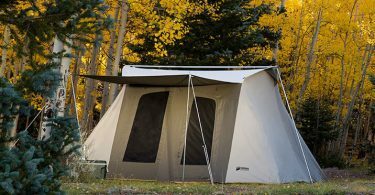 It is important to understand that if you find a tent that you like because of the size, shape, color, etc., it most likely can be made into a waterproof tent with some work by following the steps below. 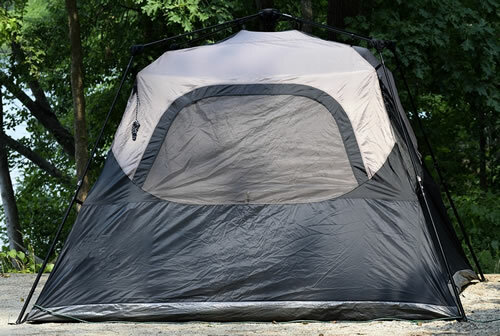 For many large car and family tents, we strongly recommend you waterproof your tent simply as a precaution. When you are camping outdoors, even when you expect the weather to be fair, an unexpected thunderstorm could easily ruin your trip if you don’t waterproof your tent. Even if your tent comes from the factory with the rain fly and seams sealed, it’s still a good idea to understand waterproof tent basics. Many of the top tent manufacturers do a very good job of waterproofing tent materials and seams, many don’t despite their claims. Tents with taped factory sealed seams have a glossy look to the seams like clear tape. This means that the factory sealed all the tiny holes around the seams that were made during the sewing process. Those tiny holes, if not sealed with tape at the factory, will leak. 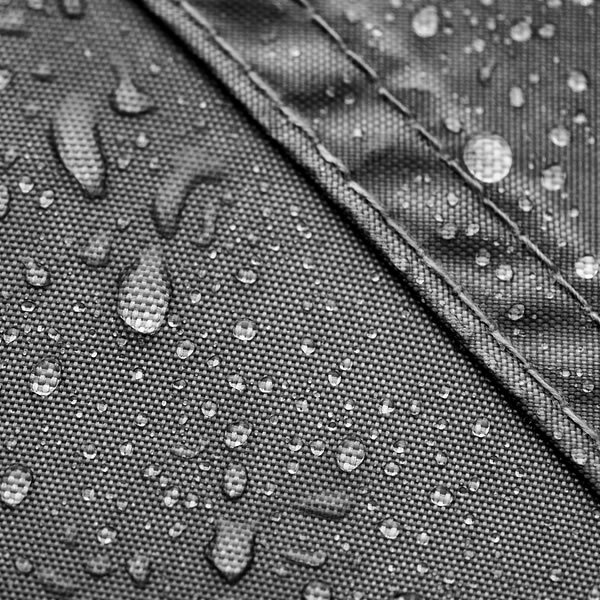 In our reviews, we identify which new tents we recommend waterproofing even if they claim to be ready for rainy weather. For those tents, we recommend the following procedure. 1) Once you buy your tent and receive it at home, open the tent and go through the set up procedure. If you have a yard big enough, do it outside. If you know it will rain within the next couple of days, or if you do not have a yard try and set aside an area inside to do this. It should preferably be well ventilated. 2) Do not put the rain fly on the tent yet, you want all the seams exposed. For smaller camping and backpacking tents (4 person capacity and under), you will be able to use a brush on seam sealer. We recommend Seam Grip Sealant with Applicator. for smaller 1 or 2 person tents and Kenyon Seam Sealer 4 Pack for 3 or 4 person tents. For larger tents of 6 person capacity or larger, you’ll want to spray on the sealer to cover the larger area quicker. Atsko Silicone Water-Guard is a popular choice for spray on sealers. Not every seam needs to be sealed. The rain fly will cover any seams around windows. 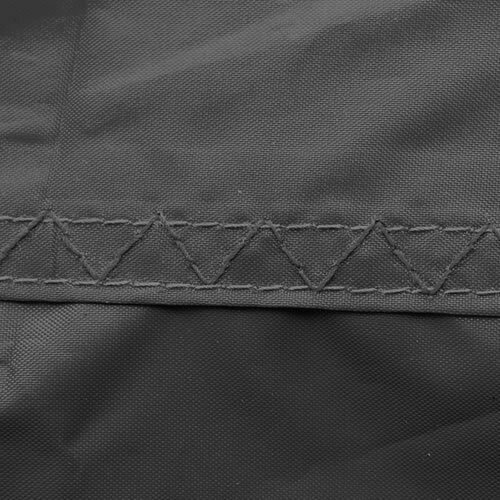 We do recommend you seal seams around the door and door zippers, and where the waterproof tent floor fabric meets the tent wall fabric. In addition, look for any seams that may already have seam tape on them, you won’t need to seal them. 3) Read the instructions on the seam sealer you purchased. They will recommend which side (inside or out) you will seal the seam. They will usually recommend how to best prep the seams. You’ll usually want to clean the seams with a brush and some isopropyl alcohol. 4) For smaller tents, use the brush applicator to apply a good amount of seam sealer to each seam you selected on your tent. For larger tents spray on the sealer liberally to the seams and the area surrounding those seams. Let the seam sealer dry for at least one hour. Then give another coating. 5) After the 1st applications have dried. Pitch the rain fly. Make sure to tighten the fly as tight as possible to expose as much of the seams as possible. Again, brush or spray your seam sealer on the seams as liberally as possible, wait to dry and apply a 2nd coating. 6) Once your rain fly seams are fully sealed, we recommend finding a way to test the tent outdoors with a water sprinkler or hose. This way you can test the tent for leaks prior to camping. Some of the larger tents in our reviews can be fully sprayed over the tent material with Scotchgard Outdoor Water Shield or Atsko Silicone Water-Guard. To do so, follow the same procedure as listed above by sealing the seams. Then, as an extra step, spray the tent fabric and rain fly with our recommended waterproof sprays. Avoid spraying the mesh screens and focus on the rain fly and tent body. We recommend this procedure for many of the Coleman and Ozark Trail Tents we recommend. These tents are mostly large tents and can be more affected by water and wind. After testing the tent under the sprinkler or with a hose, your tent material should bead water like the image shown here.